Just looking at it, sure it makes you drool. 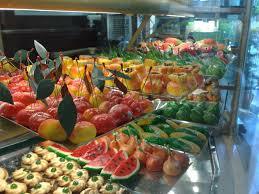 In this period of the year, every pastry shop has Martorana fruit in its window. The Martorana fruit is a sweet made with almond paste, or “marzipan”, delicious Arab invention, appreciated for its sweetness and refinement. It was prepared for the first time in Palermo, in the Benedictine monastery founded by the noblewoman Eloisa Martorana, from which, both the building and the sweet, take their name. The nuns cooked these sweets in the occasion of All Soul’s Day. They were so proud of the beauty and abundance of the fruits of their garden, that they wanted to celebrate them making art reproductions with marzipan. Here we tell how to cook Martorana fruit. Test your creativity! • 1 kg Shelled almonds • 1 kg Sugar • 200 gr. Glucose • Food colouring q.s. • Flour q.s. First, blanch the almonds and then remove the skins. Then grind in a mortar, gradually adding the sugar (for a maximum of 250 grams). Sift the flour obtained and put it in a bowl, then pour 150 gr. of glucose. In a separate pan, melt the remaining sugar and glucose doses, bringing them to a boil for about 2 minutes. Then add the syrup to the almond flour, mixing all with care to avoid the formation of lumps. Pour the mixture onto your work surface, you’ll have slightly moistened, and start to work it first with a spatula, then, when lukewarm with the hands. As soon as the dough is smooth and homogeneous, wrap in plastic film and let in the refrigerator for an hour. After this time, begin to work your dough. Divide into pieces and then give the shape of the preferred fruit. Then let dry for at least 20 hours on a lightly floured tray. Finally you can use food colouring to paint the fruit and decorate with leaves, branches or other theme elements. If you do not have almonds, you can use the almond flour (1 kg). There are also some special molds which can help you very much in shaping the fruit. So take the chance while you are staying in one of our Villas in Palermo to buy them. And don’t forget to visit the Martorana Church in the city center, perhaps eating Martorana fruit made by your own!